Type 2 diabetes is a chronic disease characterized by insulin resistance and can result in life altering complications. The number of children diagnosed with Type 2 diabetes remains relatively small, but is on the rise. 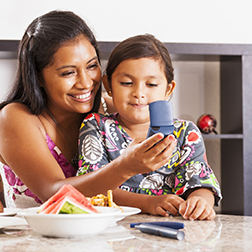 There are a number of risk factors that increase a child’s risk for developing Type 2 diabetes. There are also lifestyle changes that you can make to help prevent or delay the onset of this disease. Risk factors for type 2 diabetes in children include: relatives with type 2 diabetes, being obese/over-weight, having symptoms related to insulin resistance (high blood pressure, high cholesterol levels, polycystic ovarian syndrome, and dark velvety patches of skin on the neck or armpit), having a mom that had Gestational Diabetes, and high risk ethnic groups (African-American, Hispanic/Latino, Asian/Pacific Islander, and Native Americans) . (1) Girls have a higher risk than boys, and are most often diagnosed after age ten and during puberty due to hormone changes. If your child has any of these risk factors, you should discuss with his/her primary healthcare provider if screening for diabetes is recommended. Children with type 2 diabetes often do not show symptoms of diabetes and screening is necessary for diagnosis. Here are some ways you can help decrease the risk of developing type 2 diabetes(2,3). These lifestyle choices can benefit your whole family! Eat a healthy diet: Drink water instead of sugar sweetened drinks. Eat more fruits and vegetables; limit fast food/dining out; make sure to have health snacks available at home such as grapes, apples, carrots, non-sugary yogurt, cheese, and low-fat milk; make over favorite recipes using healthier recipes (the internet has great ideas! ); shop together, read food labels, and talk about healthier food options; serve food on smaller plates; use non-food rewards. Be active: It is recommended that children/teens have at least 60 minutes of physical activity most days. Go for walks; play in the yard; dance; play at a park; limit screen time; take the stairs; set activity goals and work to achieve them; go to the zoo or a museum and walk around; ask kids what activities they like best and being willing to participate with them; encourage them to join a sports team; to housework or yardwork; go bike riding or hiking; always be positive when encouraging activity. Weight can matter, and by making some of the above changes, your child may lose some weight. It is important not to focus on the number on the scale, but rather on making healthier life-style choices over all. Sometimes, despite our best efforts, you or your child can still develop type 2 diabetes. Symptoms of diabetes include: increased thirst, needing to urinate frequently, increased tiredness, sores that are slow to heal, and blurry vision. If you notice any of these symptoms, contact your primary healthcare provider. Even though diabetes is on the rise, what we know about diabetes and how we treat it has improved. It is important to recognize the risk factors of type 2 diabetes, but also be aware that you can make choices to help prevent or delay the onset of this disease. American Diabetes Association. Preventing type 2 diabetes in children. http://www.diabetes.org/living-with-diabetes/parents-and-kids/children-a.... 2014. CDC. Preventing type 2 diabetes in kids. https://www.cdc.gov/features/prevent-diabetes-kids/index.html. 2017.